Looking to quickly convert a Word document to a PDF? Several web-based converters have sprung up online, all promising to do the job in just a few seconds. But are these tools as good as they seem? Online PDF converters have their fare share of drawbacks. Let’s look at five reasons why you should ditch the Word documents and start creating PDFs from scratch. Online PDF converters are probably one of the least secure methods for creating a PDF. Using an online converter for a Word document means that your documents must pass through a third party before you get the finished product. And unless you inspect the small print, you may not be fully aware of how your document is being stored or processed. While hackers present a threat, there are far more mundane – yet equally important – things to worry about. Identity theft is one; straight up fraud is another. If you’ve signed a non disclosure agreement with another party, they probably won’t want you to use any kind of online conversion tool for privacy reasons. It may seem like an obvious statement, but using an online converter requires an internet connection. If you travel a lot, that’s a pain, and it could stop you meeting deadlines when you’re not connected. Additionally, think about roaming charges when you’re overseas. The last thing you want to be doing is uploading and downloading huge files; you could just create a PDF from the start and be done with it. Converting documentation to PDFs may seem like a simple task, but when you do the job properly, you can tweak settings to improve the results. Online PDF converters usually give you little or no control over how the conversion is performed and this can leave you with a substandard document which requires extensive manual edits. In some cases, you’ll need to scrap it entirely. 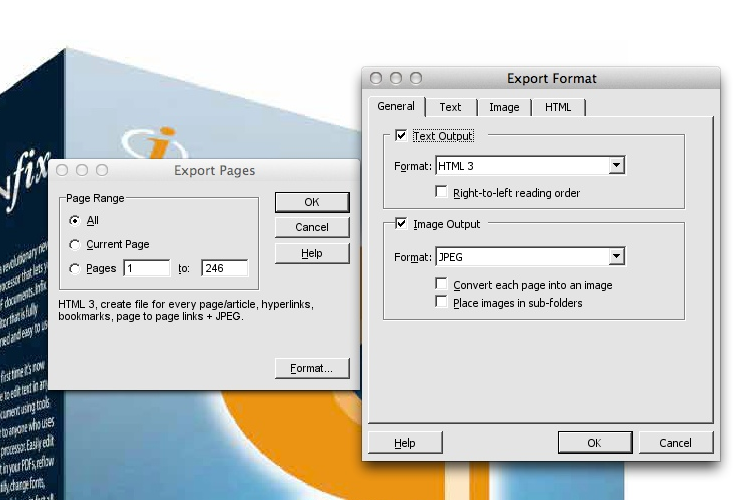 Infix PDF Editor allows you to fine-tune practically every aspect of your PDF so you can balance quality and file size. The more you delve into its features, the more opportunities you’ll find to adjust the settings to suit. Many of us work in Microsoft Word simply because we’re used to it. After years of working in offices and buying PCs with Office pre-installed, we open up Word as a matter of course. But this inevitably causes problems when the document has to be shared – PDF is a far more desirable format. Infix PDF Editor gives you the best of both worlds. It’s a fully featured document editor and word processor, yet it saves to PDF by default. And you can also use it to export files to other formats that come in really handy, such as ePUB, an ebook format. For more information on exports, and for an overview of what Infix PDF Editor can do, compare the Standard and Pro versions of Infix on our main website.